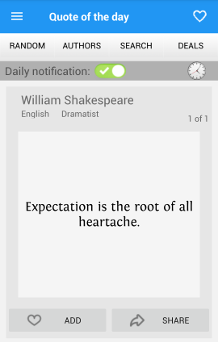 You can turn the notification off by clicking on the button to the right of "Daily Notification". You can change the time of day the quote is created by clicking on the clock icon on the right side of the screen. When you select Random Quotes, Quote It will generate 100 random quotes from the over 200,000 quotes available. By author will provide you with a list of over 20,000 authors sorted by author first name. 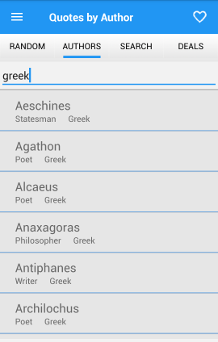 You can use the fast scroll on the right to quckly navigate alphabetically through the list or use the filter. In the filter box enter either author name, nationality, or profession or any combination of the three. Search quotes will allow you to search through 200,000 quotes for that perfect quote. 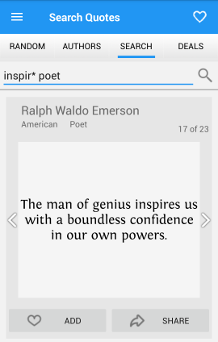 Your search will look through the quotes, authors, nationality, profession and keywords automatically for you. You can use the fast scroll on the right to quckly navigate alphabetically through the returned list of quotes summaries. From the returned quote summary list, click on any quote to change to full view. When you come across a quote you like just click the add button at the bottom of the quote to save it to your faviorites list. You can search the favorites list just like the other qoute lists. If you want to delete a quote from your favorite list then navigate to the quote and select the delete button at the bottom.